Japan's unmanned HTV-3 cargo ship is perched at the end of the International Space Station's robotic arm before its release on Sept. 12, 2012, to end its delivery mission to the orbiting lab. Astronauts on the International Space Station bade farewell to a Japanese cargo ship today (Sept. 12), ending Japan's latest delivery flight to the orbiting lab. Japan's unmanned H-2 Transfer Vehicle 3 (HTV-3) left the space station at 11:50 a.m. EDT (1350 GMT) after station astronauts used a robotic arm to detach the spacecraft from its docking port and set it free. The orbiting lab's robotic arm released the cargo ship, which is now filled with trash and unneeded items, as both spacecraft were sailing 235 miles (378 kilometers) above Canada, NASA officials said. The HTV-3 spacecraft is expected to be intentionally destroyed early Friday (Sept. 14), when it fires its rocket engines for the last time to leave orbit and burn up in Earth's atmosphere somewhere over the Pacific Ocean. That de-orbit maneuver is scheduled for about 12:50 a.m. EDT (0450 GMT) on Friday, NASA officials said. Japan's HTV cargo ships are cylindrical vessels capable of hauling tons of supplies and new equipment for astronauts living on the International Space Station. The spacecraft were developed by the Japan Aerospace Exploration Agency and are also called Kounotori, which is Japanese for "White Stork." Japan's HTV-3 robotic cargo ship leaves the International Space Station on Sept. 12, 2012, after being released from the station's robotic arm. Astronauts inside the station used the arm to detach the HTV-3 cargo ship from the station and set it free in space to end its mission. The HTV-3 spacecraft delivered nearly 8,000 pounds (3,600 kilograms) of cargo to the space station, including care packages of food, clothes and other gear for the outpost's six-person crew. The cargo ship also delivered an aquatic habitat that will eventually house fish for a future science experiment, two student experiments for a YouTube Space Lab contest, and external experiments that were moved to a porch-like platform on the station's Japanese Kibo laboratory module. Japan's HTV spaceships are part of an international fleet of unmanned spacecraft used to send regular cargo deliveries to the space station. The fleet includes Russia's Progress spacecraft, Europe's Automated Transfer Vehicles and the private Dragon space capsules built by the private U.S. spaceflight company SpaceX. SpaceX's first Dragon spacecraft flew a test flight to the space station in May, with the first operational delivery flight scheduled to launch in October. Another American company, the Virginia-based Orbital Sciences Corp., is building an unmanned space cargo ship for NASA called Cygnus. The spacecraft's Antares rocket is expected to make its first test flight later this year. 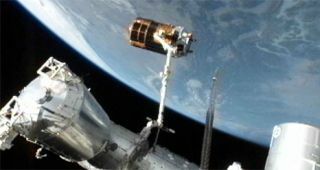 SpaceX and Orbital Sciences each have contracts with NASA to provide regular cargo delivery flights to the space station.